Tired of lugging around your old wallet and having to dig to find the cards and cash that you need? We’ve got you covered. In our front pocket wallet buying guide, we’re going to look at some super slim wallets that let you carry the basics and get to them easily through the use of a separate front pocket. Before we get started, let’s take a look at some things you should know. Material: Most of the wallets on this list are made of leather. It’s lightweight, durable, and provides a nice soft place to store your credit cards without scratching them. There are a few here that even have vegan alternatives for leather! Size: The size of the wallet matters when you’re trying to cut down on bulk. Usually, this will tell you how big the wallet is, but also how thick it is. Remember, it will be thicker when in use. Color Options: This is the number of color options that the wallet comes in. Some have an incredible number of dyed leather options that you can choose to match whatever your style happens to be. It’s a personal choice! Money Clip: Does the wallet have a money clip? This is usually a strong clip on the outside of the wallet that makes it easier and more convenient to get to your money without digging through your wallet. ID Window: The ID window also makes it easier to get to your identification, whether that’s your ID or your driver’s license. Most even have a thumb glide portion so that you can get it out quickly and without hassle. RFID Blocking: RFID waves are what make your credit card able to pay for things and be used at tills. A blocking layer makes sure that criminals can’t use a mobile scanner to collect that data while the card is put away. Now that you know all that there is to know about these products, we can get to the front pocket wallet reviews. We’ve researched a long list of products in order to bring you the top ten wallets, and we’re sure you’re going to love them! Our top pick and budget pick are the best of the best, but the rest of the wallets are amazing as well, so give them a try before you decide! 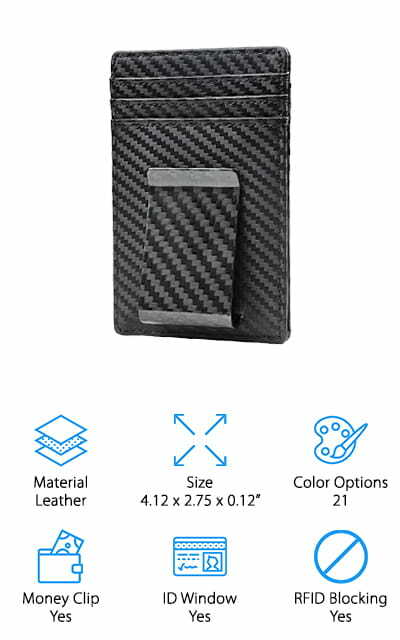 Some of the best wallets for sale are those that come with a front pocket for easy access to all of the cards you use on a daily basis. 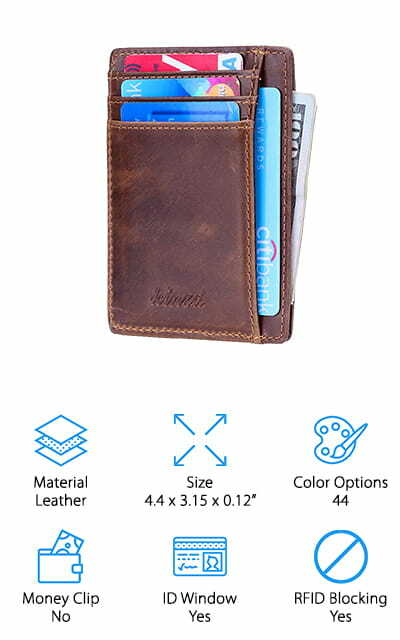 This leather wallet from Serman brands has to be one of the best front pocket RFID wallets that we found. Keep all of your sensitive information private, because it blocks RFID signals that are higher than 13.56 MHz. 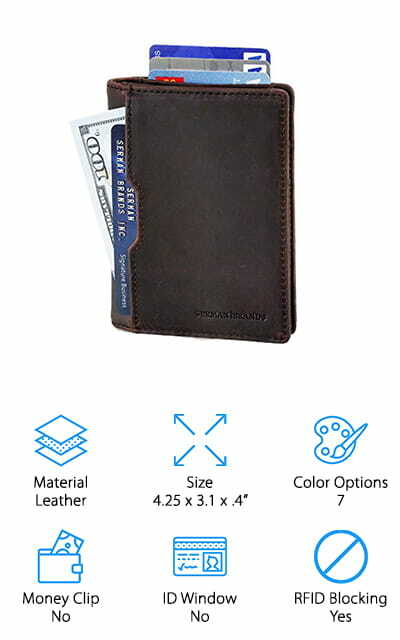 The special metal composite in the wallet allows for your information to be kept safe and secure. The front pocket can hold your daily card, and there are also four interior pockets for things you need to get to quickly. There’s a smart strap to allow you easy access to all of your cards, and your cash will fit in the half fold on the side as well. It’s very slim and comes in seven great colors, including green, blue, and red leather. It doesn’t get much simpler! The best cheap front pocket wallet on our list comes from NapaWalli, which makes this super slim card carrier. 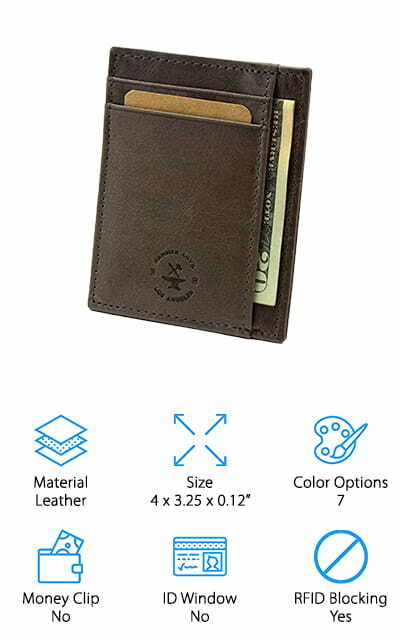 They boast that their authentic cow leather wallet is protected with military-grade RFID signal block so that wireless readers can’t get at your information. That’s an invaluable asset in today’s world! There are five card slots, two functional card slots that you can get to easily. But this is a minimalist front pocket wallet that also has an ID window so you can easily show it when you need to. There’s even a larger pocket for additional cars, or else for storing money or receipts. It’s so thin that you aren’t going to be able to feel it in your pocket, and we love that! It’s a functional, compact design that you can use to carry everything you need. Did we mention it comes in 36 colors? Some of the unique selections are yellow, orange, and even pink! 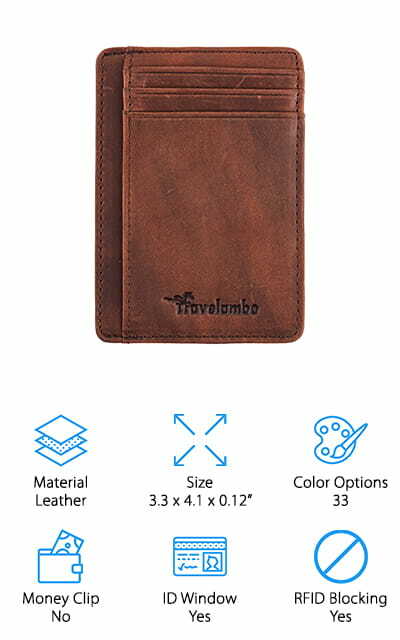 This super slim wallet by Travelambo works tirelessly to protect your personal information by using beefy security measures to block RFID signal. This means that your credit cards and ID cards can’t be scanned for later use by criminals. 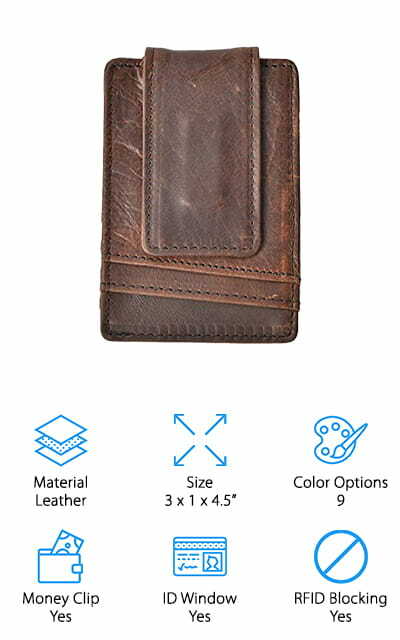 It’s one of the best leather front pocket wallets because the leather is smooth and soft, perfect for being able to get what you need to out of it. There are six different card slots so you can easily access what you need to easily. You can carry it in your front or back pocket, and it works the same to block RFID waves. It’s so light you won’t even feel it! There are 33 color options, which includes an honest red color, different shades of blues and greens, and even a yellow option. They’re all different colors of leather, so you won’t have to worry about quality declining with these options. It’s a great, simple product that works well! This men’s front pocket wallet is a great accessory for someone who doesn’t like carrying a lot around. There are six card slots and a middle section for money, so you can only take what you really need – only the most important cards, with none of the others that you would be bogged down carrying around. It’s so slim and compact, and light enough that you won’t know that it’s in your pocket! But that’s not all – it can hold a stunning amount of stuff for a wallet its size. It’s one of the best RFID front pocket wallets on our list because it blocks the frequencies that your IDs and credit cards run on. This allows you to feel secure that your identity and information is remaining private! It’s comfortable and light, and comes in seven great colors – mostly shades of blue, grey, brown, and black, nice masculine colors that you won’t mind carrying! One of the best men’s front pocket wallets that we could find was this leather one by Kinzd. It’s a wonderfully accommodating lightweight wallet with an ID window. When you need to remove your license or ID card, simply use the finger glide window on the front to get the car out quickly and easily – that’s super convenient. 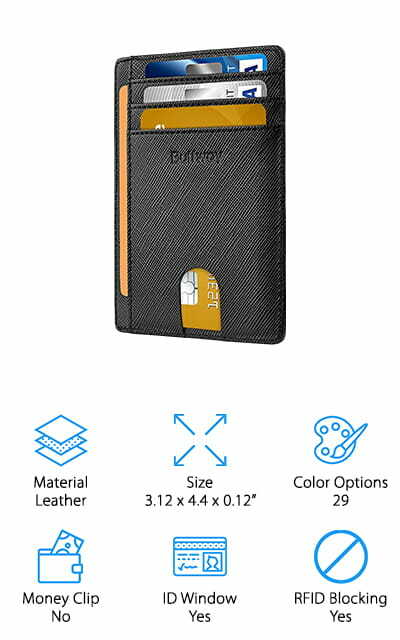 It fits well in either front pockets or back pockets and has six card slots, including the ID window. There is also a pocket for cash, receipts, and other odds and ends in the middle of the wallet. Your identity is safe with the RFID blocking that this wallet provides, meant to stop portable scanners from picking up your signals as long as the cards are inside your wallet. While most of the wallets in the color options are leather, there is a notable exception. If you’re vegan and don’t want to carry leather, they’ve provided a cork alternative. Our front pocket wallet reviews wouldn’t be complete without the inclusion of this Buffway wallet. Like the others on our list, it’s slim and compact and comes in many different colors so that you can accessorize exactly how you want. This includes purple, a wine color that’s unique to this product, and different shades of greens. All of their wallets are made from genuine leather, so they’re durable without being overpowering, and still stylish enough to work well for anyway. It effectively blocks the RFID signals that make your information accessible, which is incredibly important. What sticks out to us about this product, in particular, is the replacement guarantee. If you don’t love it, you can return it and get a different color or get your money back. It’s risk-free! And it’s usable by both men and women! The leather only gets softer and more comfortable over time, which is a bonus, as it’s already pretty comfortable. This wallet is super thin! And when we say thin, we mean it. Without adding any cards to it, it’s only about the size of two credit cards pressed together. It’s impressive that it’s thin like that while still remaining durable and useable. 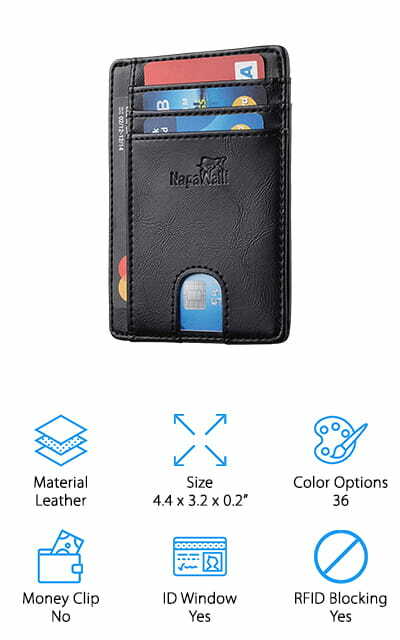 There are four card slots, two on either side of this wallet, as well as a finger glide ID window that helps you quickly get to that particular card when you need it the most. There’s a zipper currency pouch in the side that will hold all of your cash and possibly your receipts, and two slide-in slots on the sides for quick access to the cards that you use most often. This wallet by GintaXen is unique on our list because it’s a bit bigger than some of the other wallets on our list. That’s not a bad thing at all, especially if you have a lot of things you need to carry with you. The colors it comes in are all variations of browns, blacks, and greys, which makes it perfectly masculine and ready to go with just about any style. 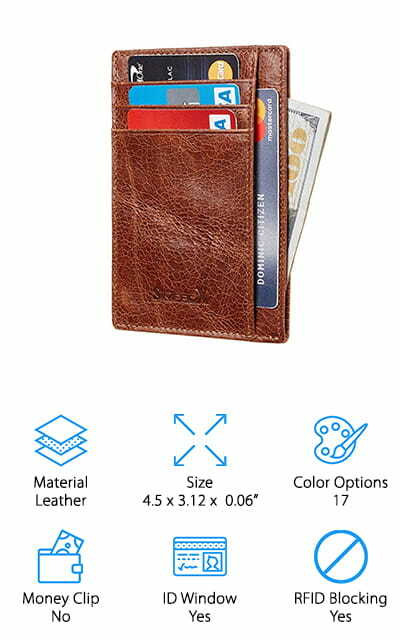 You can hold a maximum of ten cards with this wallet, as well as keeping your cash in the folding pocket on the side. There is one quick access front pocket for your most-used card as well as a window for your ID and license. 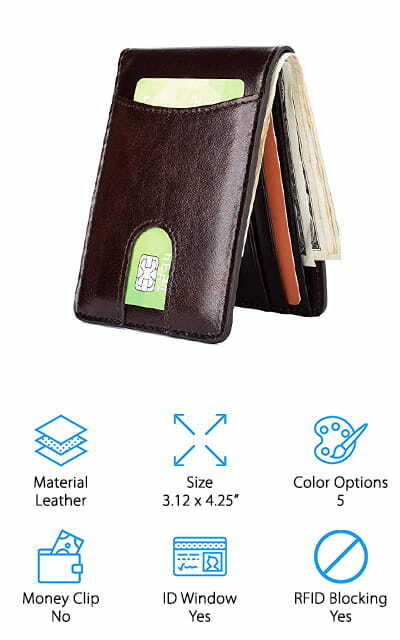 It’s made of high-quality leather and actually folds out into a close-to-full-sized wallet. Even though it’s not a slim wallet, it’s still much slimmer than similarly-styled wallets, which is pretty amazing! We love the advanced RFID layer to keep you safe! This stellar wallet from Travelambo is a great front pocket wallet with money clip and ID window included. The money clip is a powerful metal affair that won’t demagnetize your credit cards but will keep your money convenient and easy to get to. It’s also strong enough that it will keep the money clasped tight to your wallet, and it would take significant or purposeful force to get it out again. It’s made of excellent quality leather and will comfortably fit into any sized pocket. Women can use it to, and it will even fit into their pockets most of the time. The RFID blocker is significantly strong enough to stop readers from catching onto your information. There are 3 card slots to use for your most important cards, as well as an ID window on the front so you don’t have to go digging for your identification card. This might be the best front pocket wallet with money clip! If you still aren’t convinced that a leather wallet is for you, consider this one from Hopsooken. It has both the money clip and the ID Window – features that not even a metal front pocket wallet could pull off! It’s a super slim design available in nine colors, including different types of leather finishes. If you prefer napa leather, you can get that, or crosshatched leather, or even distressed natural-looking leather! We think that’s a pretty awesome level of customization. It works really well if you’re tired of carrying around a big, bulky wallet. The money clip is powerfully magnetic, and there are 6 protected card slots. Neither the magnet from the money clip or any RFID scanners will be able to penetrate this product. We also love the change pocket in the middle of the wallet, which comes in handy. The ID display window has a finger slide so you can quickly access your ID.